Visiting women’s prisons in Afghanistan is a sobering affair. At the prison in Mazar i Sharif, women and men share the same prison compound but the women’s section is behind a locked metal door just off the main courtyard. Behind this door are forty women and fourteen young children. Inside is a small courtyard and two small rooms where these convicted prisoners and their children spend their days. This multi-purpose communal space is all these women will see for the duration of their sentence. It serves as their sleeping quarters, daycare, dining hall and classroom. We walk through a small doorway out of the rain and into the larger of the two rooms where a sea of multi colored headscarves fills up the entire space. Women of all ages and several young children and babies are learning to read and write. The sea turns to see who has arrived and miraculously parts to allow us space to enter. These women comprise the entire female population for the whole province. They are convicted of murder, robbery, prostitution, and the ever-ambiguous crime of adultery. We are offered one of the few floor cushions and one of the prisoners brings us tea and a small plate of cookies, Afghan etiquette firmly in place, even in prison. A young woman, Armeene, sits down next to me with her tiny three-month-old daughter, Suyafa. Both her and her husband are in jail and her young daughter will be raised here until Armeene is released or Suyafa reaches age six. She is one of fourteen children being raised in the prison. Once they are school age, they will either join their other siblings at home or become temporary wardens of the government at an orphanage set up for children of prisoners. Either way, their early years are spent in the same crowded and sparse confines as their mothers. Forty women sleep in these two small rooms side by side, a few choosing space in exchange for the chill of sleeping outside in the courtyard. These women spent 24 hours a day within a few feet of each other and rather than turn against each other, they build a community of sisterhood, taking care of each other and the children. As if to prove the point, Maidezel is passed one of the younger babies, which she places in her lap as though it’s her own. As we continue to talk more and more women from outside join us and soon it is though we are facing a female jirga. The room is filled to capacity with women sitting cross-legged, many with children in their lap. Many don’t have any idea of the length of their term, and Dr. Fazee says that’s because many asked not to know. They seem to be the ones with the longest potential sentences, those in for murder. The majority of the women here are charged with murder and adultery. Nineteen-year-old Sayra gets released tomorrow. With vibrantly dyed red hair, she sits snapping chewing gum in the back of the group. She has spent 3 months in jail with a vague charge of runaway. She says her husband is also in jail, which seems to set up a squabble among the women, many saying that he’s not her husband. Prostitution seems the likely offense, especially given the short sentence. We move into the smaller room which doubles as the vocational room during the day, two sewing machines set up in the middle of the small space. Sleeping blankets piled up in the corner, with an older woman resting on the pile. Here the women learn handicrafts and tailoring in the hopes that they develop a useable skill that they can use when they are released. Maidezel follows us in, taking a place behind one of the sewing machines, asserting her authority as it were. A beautiful woman sits behind another in the corner, smiling kindly at us occasionally while she works. Several more children join us and when the camera comes out the mood in the room shifts and suddenly the children are clamoring for photographs to be taken, jabbering to us in Dari, and all smiles when we show them their photo. The woman in the back, 30 year old Shakeela, smiles broadly at the children. Her youngest, 4 year old Hujasta, is in the photo-centric group and has been hamming it up for the camera. Shakeela is one of several women in here convicted of murdering her husband. Many of these women were sold, or forced into marriages with much older men, beaten and raped. Divorce is not an option, neither is simply running away. Some of these women are charged with adultery, which is often a false crime as the women are most often raped by a male family member or friend and to save face the blame is placed on her to bear. These women are often disowned by their families and as convicted criminals, outcasts by Afghan society. The handful of social workers that are working with the prisoners focus their work on liasioning with the families to educate them and build sustainable bonds so that these women don’t end up on the street. At the same time, literacy and vocational programming is the key to giving the women the tools they need to build a better life for themselves when they are released, and the children a decent start on life despite spending their young lives behind bars. The visit to Kabul had many purposes. The longterm goal was to discover how to support the growth of Afghan education and school building in a region that has dealt with losing many schools to the Taliban as recently as a couple months ago. How best could we find sustainable and progressive projects that we could work to garner support for here at home. Could these be built safely and securely in outer provinces or should they remain in Kabul one of the few areas still considered relatively safe in comparison. If they needed to be focused on Kabul, is there a need, or are there already enough schools and enough support. How do we safely get them built, get the money to the project and oversee the project from afar? Who do we trust to liaison? I got these questions answered, and much much more during my short two weeks in Kabul thanks in part to my amazing translator, Najibullah. Naji knew that I was coming over so that I could meet with several girls schools and was open to seeing others. He took this and ran with it….tugging at my already strung out heart strings. He opened my eyes to the many opportunities we could get involved with, from deaf schools, to girls schools, to schools for streetchildren, to vocational schools preserving Afghan culture while creating work opportunities. The first school we visited was with Aschiana, an organization focused on providing education and vocation training for streetchildren. The school is one of many that Aschiana runs. They work around the needs of these streetchildren to make money for the family by being flexible with the schooldays and working with the families to understand the value of education. The surprise of the visit was that besides basics like literacy and languages (all schoolchildren in Afghanistan learn Dari, Pashto, and English – better language skills than most educated Americans), they also learn painting, calligraphy, and music. We sat in on several classes and the hands-down highlight was music class. Two adult teachers were playing the sitar, while two young students were playing tabla (drums) and a strange musical hybrid keyboard/accordion. The rest of the class sat around, boys on one side, girls on the other and sang traditional Afghan songs. It was enthralling, and we stayed for a long time enjoying the impromptu concert. The second school was all Najibullah. It is Afghanistan’s only deaf school. Unplanned on the original wish list, Najibullah made it clear we needed to go here. I have never seen such unadulterated joy as I saw on these young faces when they saw us pass by. Excitement pulsated through the halls and within every classroom we visit (10 or 12 in a rapid fire visit). We learned immediately how to say “Salaam” by placing one hand at our brow, much like a military salute. Followed by a thumb’s up. We made this greeting to every classroom to huge smiles all around. We learned several other signs as we moved from classroom to classroom, so that by the time we left we had learned around a dozen signs. The founder of this school is also deaf, and speak four languages in sign. He is a passionate advocate for building more schools and working with the families to learn sign to communicate with their children. Over 10,000 deaf live in Afghanistan, most of them growing up in complete isolation, being unable to communicate with their own family and lacking any social group or friends. Until the completion of Kabul’s deaf school, there was no opportunity anywhere for this demographic to receive an education. The goal is for more schools to be built throughout the country and to develop more regional ‘outposts’ where families can go to learn sign and better understand their own children. A unique approach to cultural preservation was discovered at Turquoise Mountain’s headquarters and center for higher education which is focused on this preservation of culture through education. A complete compound with various buildings housing different artisan workshops and classrooms. Pottery, calligraphy, woodworking, and jewelry making were all run by masters found from across Afghanistan. The apprentices learn under their tutelage and after 2-3 years will complete their cultural education in their particular vocation. These students will ensure that the traditional Afghan arts are not lost with the eldest generation’s passing. Reinvigorating the Afghan culture and with it, the market for its artisan’s work. The same afternoon was spent touring the Murad Khane restoration project that falls under the leadership of Turquoise Mountain. Located in the heart of old Kabul, an area with no sewage or running water, and buildings that collapse weekly. Turquoise Mountain has undertook a large restoration of the old bazaar, encompassing several buildings. Inside the beautifully restored Peacock House are a couple of classrooms for the local children that live in this squalor filled area of Kabul to attend school. We sat in on a small classroom of young boys who immediately offered to sing songs. One at a time, boys would stand up and sing us a little song, some shyly and some with great enthusiasm. Having interrupted their English lesson we didn’t stay too long before going upstairs to another classroom focused on vocational training for embroidery. Women of all ages sat around the edges of the room working on different designs. Here was example of vocation training and preservation of culture on a very small, intimate level akin to a widow’s tailoring project we had visited earlier in the trip. We visited girls’ schools and co-ed schools, and other small vocational projects. All with similar focuses on combining education, preserving Afghan culture, and developing useable vocational skills. Each one inspiring me further to find ways to develop multiple projects under Mountain to Mountain’s banner. There are several ways to fund our own projects there to build deaf schools, schools for streetchildren, and girls schools…all desperately needed, all sustainable, and all easily completed. 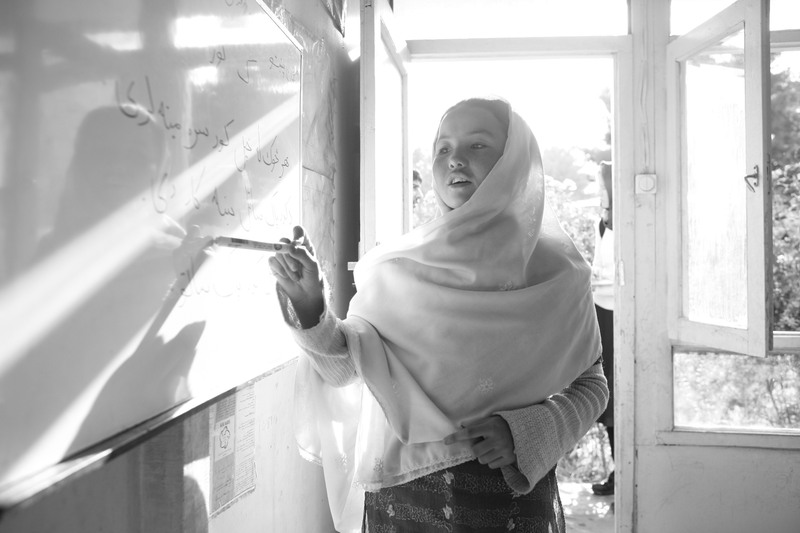 In my journey to discover how to support the education of Afghans, that my education began.